The new NHS medical centre is said to be one the UK’s largest. A new third floor allowed the provision of a sophisticated roof-top conference and meeting room. An unused Nineties office block has been revitalised and extended to create a medical centre to cater for the increasing population of the town. Barbara Weiss Architects (BWA) has completed the extensive refurbishment, extension and change of use of a redundant Nineties' office block into the new Wokingham Medical Centre, creating one of the UK's largest single-site GP practice. Previously occupying two sites (Tudor House, a 16th-century merchant's house and a converted Edwardian town house) for 40 years, the medical centre has a proud history going back over a century of serving the people of Wokingham. 'Although the existing buildings were much loved and served the practice well, they were no longer suitable for the needs of Wokingham's population,' explains Barbara Weiss, director of BWA. A development of 4,000 new homes in the town may see the two centres' patient list reach 10,000. 'Also as part of NHS reforms, many hospital services are being relocated into local GPs' surgeries as well as the co-location of other medical disciplines such as dentistry, pharmacy and physiotherapy, none of which the existing premises could accommodate,' adds Weiss. 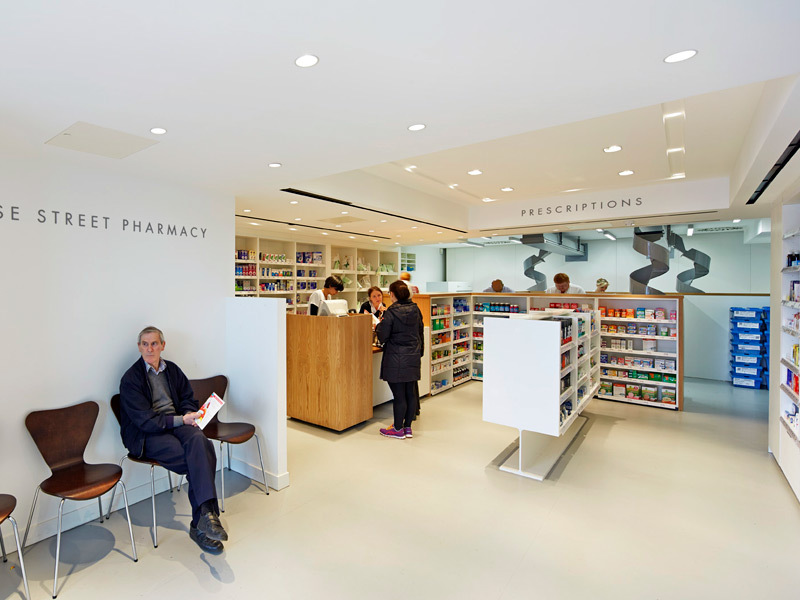 To address these issues Wokingham Medical Centre set out to bring its two branches into a single, large, modern, town-centre premises. It provided BWA with a brief to accommodate a large number of patients (the centre will serve a catchment area of up to 32,000) and GPs in a 'calm, non-insitutionalised' environment. Now, Wokingham Medical Centre has a building with new facilities for up to 16 GPs and five nurses, a new pharmacy and flexible medical suites. Due to the variation in Wokingham's building styles, ranging from 14th-century timber-framed buildings, to white-rendered Georgian houses and Nineties' redbrick office blocks, the challenge for BWA was to design the centre with materials and an appearance that were contextually appropriate as well as practical for use in a modern public medical facility. 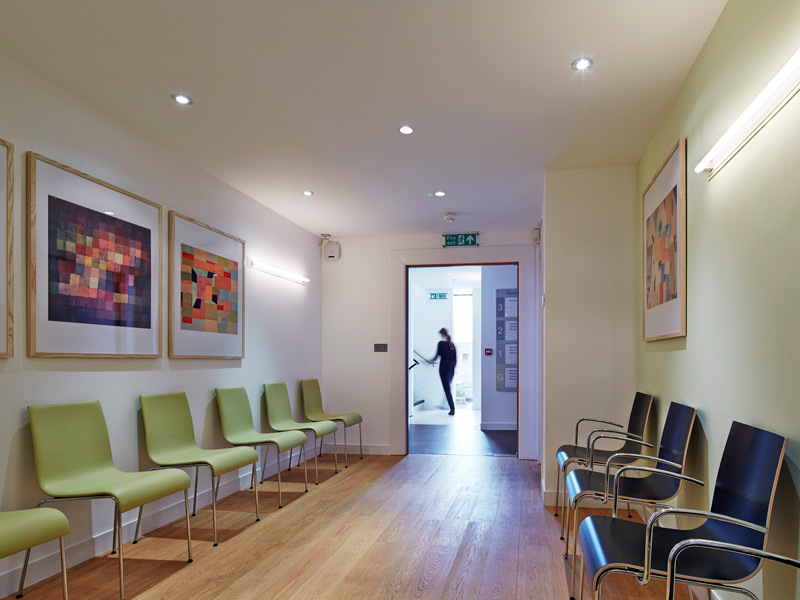 BWA began the design process with a complete strip-out of the existing steel frame and cavity-wall building and remodelled the space to meet a number of key objectives, including the need for additional floor space for the new services and clinics and additional consulting and treatment rooms. BWA positioned the main surgery entrance on the ground floor within a large canopy with curved ends to mirror the existing curved stair tower. The ground floor also houses the reception, administrative and waiting areas, nurse and treatment rooms, and the pharmacy, which was also designed by BWA. A sliding gate aids flexibility for the space, separating the surgery reception from the pharmacy entrance to enable out-of-hours use. 'Bringing natural light into the deep-set building was a priority, so roof lights were introduced wherever possible,' says Weiss. 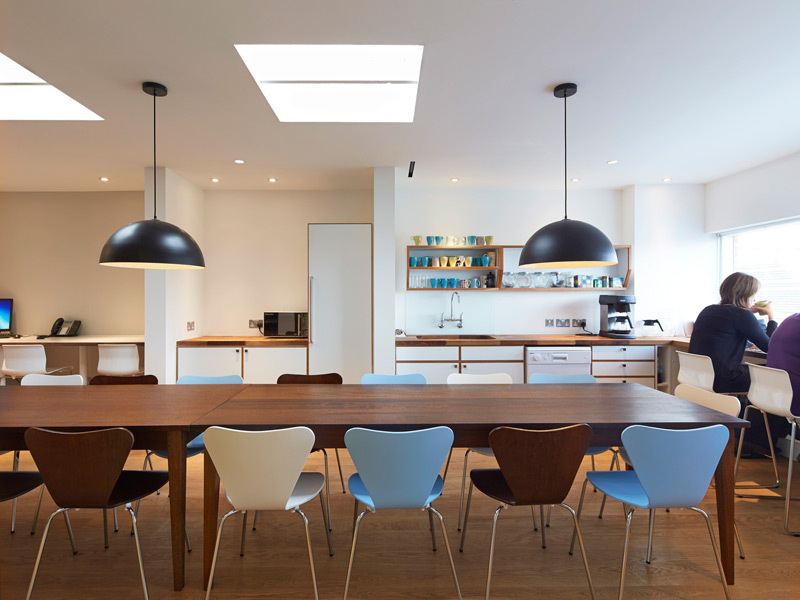 And looking up to an extensive provision of roof lights that enable natural light to flow into all rooms on the second floor, BWA has certainly achieved this. 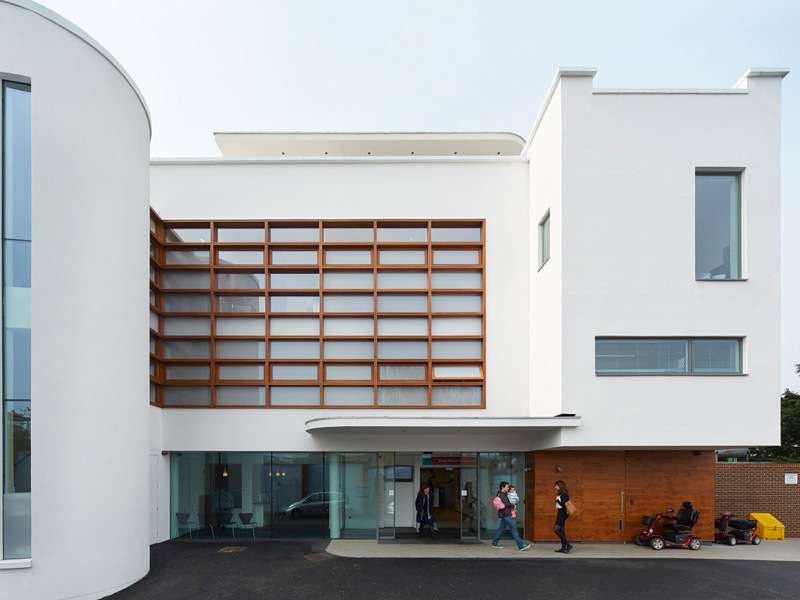 The new wing of the building was also designed to provide the maximum amount of light into the consulting rooms, through the custom-designed curtain wall. 'New large windows also allow an abundance of light into the offices along the front. In response to privacy and infection control requirements, "intelligent" smart glass was specified to the curtain wall. The glazing changes from clear to opaque at the switch of a button,' says Weiss. The upper levels, above the entrance, are enclosed with a bespoke curtain wall system, constructed of oak and Intelligent Glass, designed specifically for the project. Intelligent Glass, at the touch of a remote control button, alternates between opacity and transparency, permitting doctors to offer their patients both privacy and daylight. 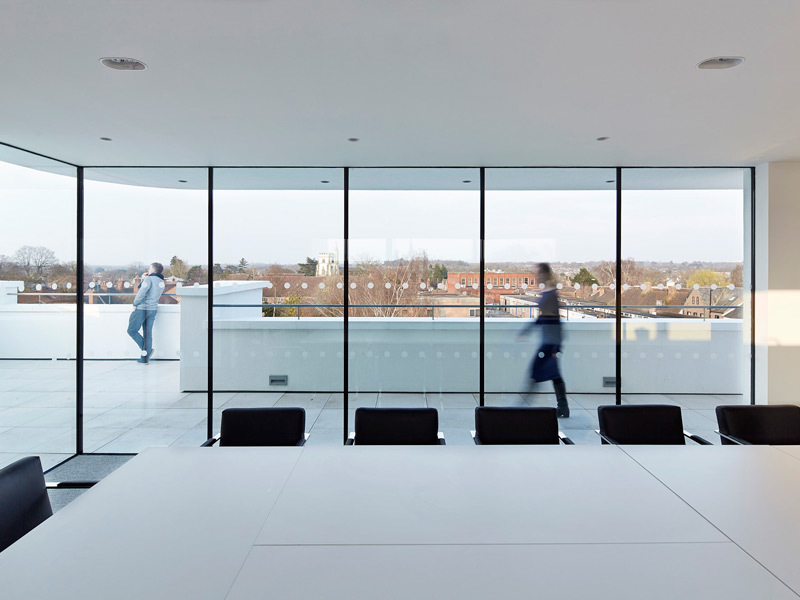 Along with a number of alterations to the existing built fabric, BWA designed the integration of a new third floor to accommodate a pavilion, housing a meeting and conference space. 'The conference room pavilion on the roof was designed to give an air of sophistication,' explains Weiss. 'It has a frameless glazed facade, with full-height doors opening on to a large terrace. A long table runs down the centre of the room - it's a very grown-up space!' Externally, the new extensions are rendered with simply proportioned window openings. 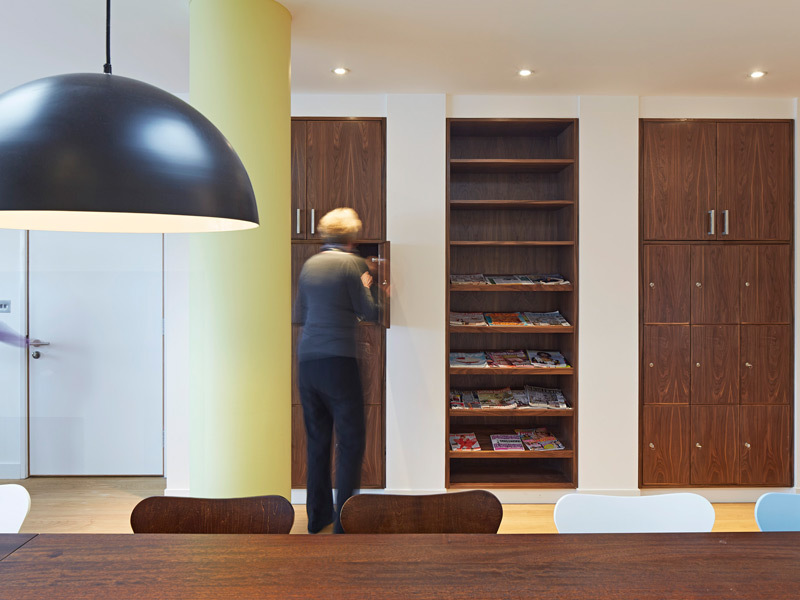 To achieve the 'non-insitutionalised' environment BWA focused on material finishes. Though aware of the standards surrounding a modern clinical practice Weiss says that the consulting rooms were divided into two parts: 'The warmer "friendly" consulting area has hand-painted and cherry-veneered joinery, but the examination area consists of white laminated joinery, glass splash backs and wall-mounted ceramic basins with sensor-operated taps.' Floor finishes were also carefully considered in order to create a 'welcoming but elegant feel', specifying oak floorboards in the waiting areas to provide warmth, with natural rubber floors installed in the medical areas and stairwells. 'The main entrance area is Cumbrian slate, a nod to the leading doctor's passion for climbing in the Lake District,' says Weiss, demonstrating how BWA recognised the need for a much more human approach to the scheme.